I went into the local bookstore looking for a particular book. When they didn't have it, I wandered over to the "Customer Recommendation" rack to see what my fellow City dwellers had to say. Suite Francaise caught my eye with its intriguing front image. 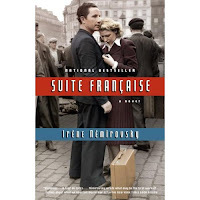 Written by Irene Nemirovsky, a Jewish writer living in France who was eventually killed at Auschwitz, Suite Francaise takes place during WWII, starting with the evacuation of Paris and subsequent German occupation. From the beginning, you feel like you are in the trenches with the evacuees. You can feel the basic human instincts of all these people, from the rich family who first hands out bonbons to other children, naively thinking they'd be able to buy more, to the middle-class couple who gets left behind due to a greedy boss and his shrill mistress, to the wealthy older man who siphons gas from a young, in love couple who he has encouraged to take a walk. The reader can feel the confusion, and eventual desperation, as the characters realize that this isn't a quick thing, that money won't bring back their loved ones, or buy them food when none is available. You can also feel the conflict of happiness when some of the characters return to Paris, knowing that others are perishing not-too-far away. The second half of the book, Dolce, explores the occupation. How do you live every day hating the person staying in the room next door? How do you balance loyalty to your country, husband, father, while becoming friends with the enemy? How do you deal with the inner turmoil of the monster becoming the object of your affection? Nemirovsky eloquently delves into the human psyche, that we are not programmed to hate, that, rather, we are able to adapt and even love conditions that may seem unfathomable to the casual observer. What struck me most about this book was the epilogue. Rather than just a small notation on the author and the story, it gives great insight to the writer. The author's daughters, after years of not being able to look in their mother's notebooks, shared a piece of her with the reader. We get to see all of her notes, her whole process in developing the book, and where she planned to take each character. It was fascinating. Beyond that, the book includes the author's correspondence during the war to her publisher, trying to get her royalties. You can see the timeline of the war through these letters, how it became harder and harder for a Jewish person to make a living. We get to see her very last letter to her family, then her husband's desperate pleas to find her. It is a first-person account of something we rarely read in a history book. This book was a true surprise to me. I wish I had found such a treasure earlier.